Microscopic description: The smears show high cellularity, consisting of several loose aggregates and some acinar-like fragments in the background of numerous naked nuclei and isolated cells. 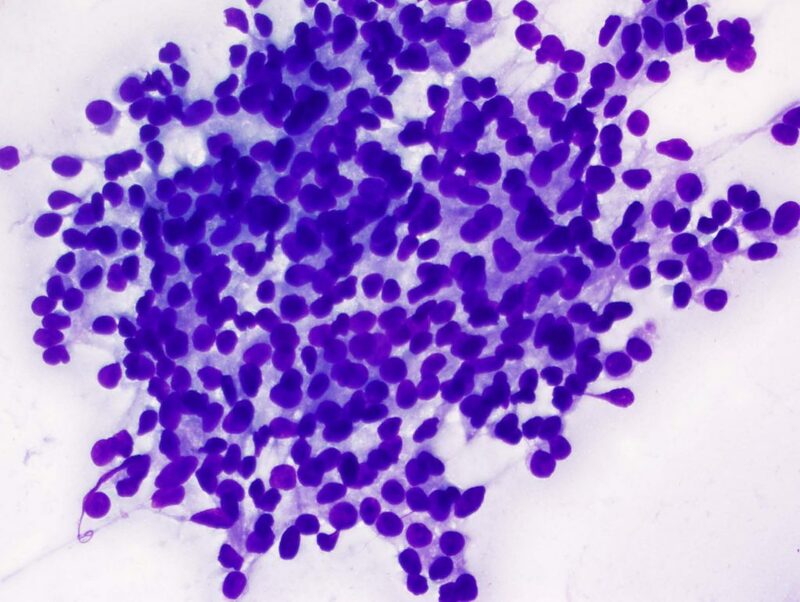 The tumor cells reveal round to oval nuclei with prominent nucleoli and moderate amount of granular cytoplasm. Anisonucleosis is observed. 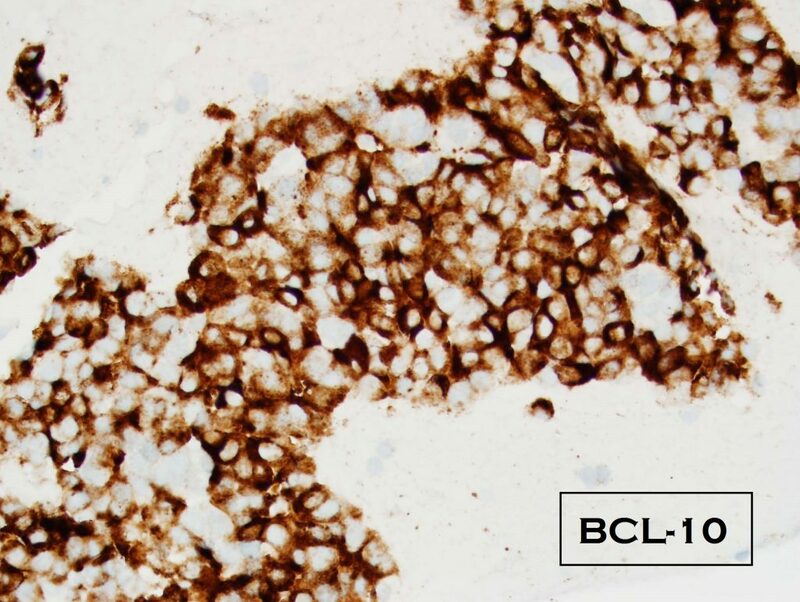 Strongly positivity for BCL10 immunostaining confirmed the diagnosis. Differential diagnoses: Benign acinar cells usually arrange in grape-like clusters and have small inconspicuous nucleoli. Ductal adenocarcinomas show disarranged glandular structures. The cells are large and columnar with abundant cytoplasm. Some intracytoplasmic mucin may be seen. The nuclei show marked anisonucleosis. Loss of DPC4 immunostaining supports the diagnosis. PanNET is more difficult to distinguish from ACC. 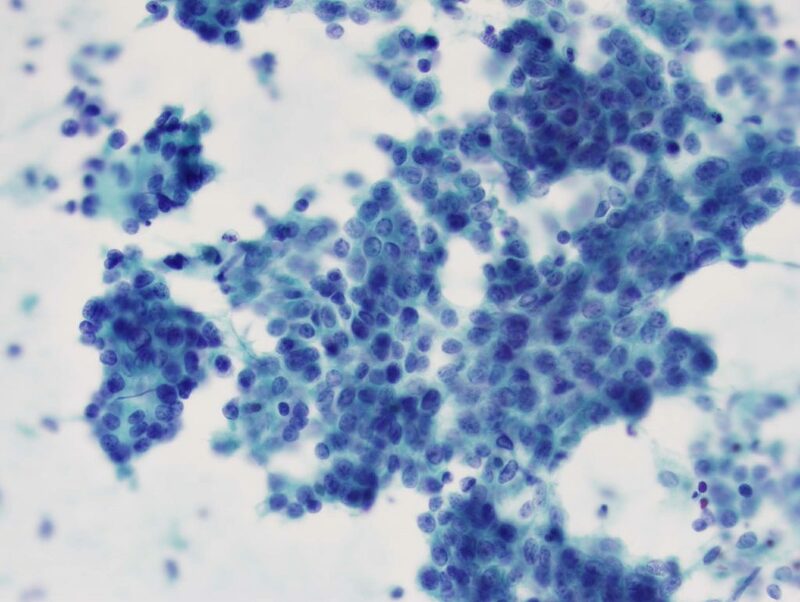 Both tumors have rosette-like structures, prominent nucleoli and abundant granular cytoplasm. PanNETs are always strongly positive for at least one of the neuroendocrine markers. SPNs have myxoid or hyalinized vascular stalks lined by cells with scant cytoplasm and ill-defined border. The nuclei are round to oval with inconspicuous nucleoli. Some show nuclear grooves. SPNs are immunoreactive for β-catenin. In this case, the tumor cells are focally positive for CD56, INSM1 and DPC4. 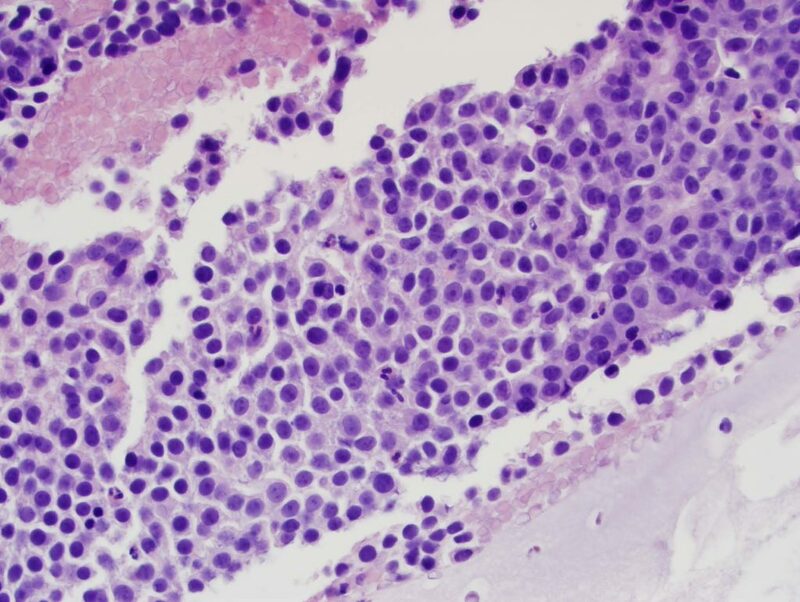 La Rosa S, Sessa F, Capella C. Acinar Cell Carcinoma of the Pancreas: Overview of Clinicopathologic Features and Insights into the Molecular Pathology. Frontiers in Medicine. 2015;2:41.